Score a goal for holiday gift-giving with this Detroit Red Wings Christmas tree ornament. 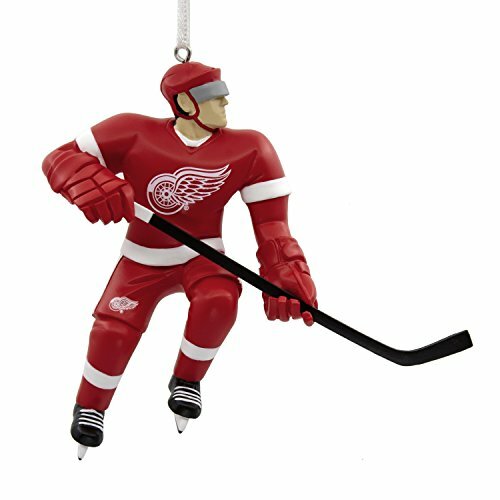 Any Red Wings fan would be proud to display this stylized ice hockey player ornament on their tree. Features signature red and white team uniform. Made of resin, this Hallmark Ornament measures 3.9 x 3.7 x 1.18 inches. The ornament is ready to hang on your Christmas tree with a hanger attachment. Perfect gift for fans of the National Hockey League and the Detroit Red Wings. Hallmark Ornaments celebrate characters from contemporary and classic movies, TV shows, toys and entertainment. Each festive and collectible ornament is perfect for sharing with family and friends. Each purchase includes one lead-free Christmas tree ornament packaged in a gift-ready box. Detroit Red Wings fans will love to show off their team pride when they display this stylized ice hockey player Christmas tree ornament. Features signature red and white team uniform. Made of resin, this Hallmark Ornament measures 3.9 x 3.7 x 1.18 inches. The ornament is ready to hang on your Christmas tree with a hanger attachment. Perfect gift for fans of the National Hockey League and the Detroit Red Wings.